The Actors Studio is a membership organization for professional actors, theatre directors and playwrights at 432 West 44th Street in the Hell's Kitchen neighborhood of Manhattan in New York City. It was founded October 5, 1947, by Elia Kazan, Cheryl Crawford, Robert Lewis and Anna Sokolow, who provided training for actors who were members. Lee Strasberg joined later and took the helm in 1951 until his death on February 17, 1982. It is currently run by Al Pacino, Ellen Burstyn, and Harvey Keitel. The Studio is best known for its work refining and teaching method acting. The approach was originally developed by the Group Theatre in the 1930s based on the innovations of Konstantin Stanislavski. While at the Studio, actors work together to develop their skills in a private environment where they can take risks as performers without the pressure of commercial roles. Before settling in its current location in 1955, the Studio moved regularly over an eight-year period: In January 1948, it was a dance studio on East 59th Street. In April of that year, a move to the CBS Building at 1697 Broadway, near 53rd Street, established some semblance of stability; the Studio would not move again until the summer of 1952. From that point, the old Theatre Guild rehearsal rooms on the top floor of the ANTA Theatre became home, as they would remain until October 1954, at which point theatre renovations reduced the Studio to simply renting space twice a week. This it did at the Malin Studios at 1545 Broadway, room 610 (entered on West 46th Street). This arrangement would persist throughout the 1954-1955 theatrical season, even as the Studio was acquiring and renovating its current venue. 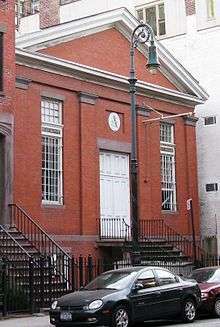 In 1955 it moved to its current location in the former Seventh Associate Presbyterian Church, built in 1859. From September 1994 through May 2005, the Studio collaborated with The New School in the education of masters-level theatre students at the Actors Studio Drama School (ASDS). After ending its contact with the New School, the Actor's Studio established The Actors Studio Drama School at Pace University in 2006. 1 2 Garfield, David (1980). "Birth of The Actors Studio: 1947-1950". A Player's Place: The Story of The Actors Studio. New York: MacMillan Publishing Co., Inc. p. 54. ISBN 0-02-542650-8. ↑ "30c Dinners Offered to Actors by Church Planning Restaurant Operated by Them" The New York Times. March 29, 1935. ↑ Driscoll, Charles B. "New York Day by Day". The Washington Reporter. December 2, 1939. ↑ "Actors Kitchen in Church Closed". The New York Times. May 17, 1942. ↑ Garfield, David (1980). "Strasberg Takes Over: 1951-1955". A Player's Place: The Story of The Actors Studio. New York: MacMillan Publishing Co., Inc. pp. 111–114. ISBN 0-02-542650-8. 1 2 Lee Strasberg and Viveca Lindfors were Actors Studio members number 1 and 2. ↑ Deodato, Ruggero (12 November 2000). "Cult-Con 2000". Cannibal Holocaust DVD Commentary (Interview). Interview with Sage Stallone, Bob Murawski. Tarrytown, New York.